A new viewing point high above the village of Gleneely offers a spectacular panoramic of Inishowen, from Five Finger’s Strand though Culdaff to Kinnego Bay and beyond. Nestled just below the summit of Crockanoneen, the large platform, including parking for scores of cars and buses as well as a number of picnic benches, is currently under construction with an official opening tentatively planned for next month. “On a clear day you can see as far as Scotland,” said Joe Kearney, one of those in the Gleneely Development Association, the group behind the new high altitude car park. It is a rare bright spot for a local village that has in recent months lost a post office along with its one remaining shop and filling station. 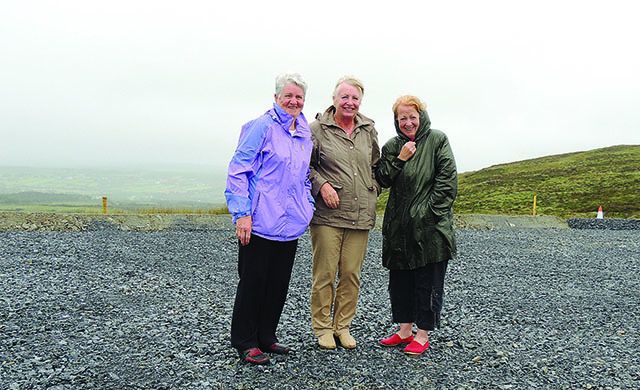 An Inishowen Independent visit to the car park on a grey and damp morning last Friday didn’t afford the usual breathtaking views but members of the development group were upbeat nonetheless. “Really we have been planning this for two or three years now. When you come over the mountain road you couldn’t help but notice the amazing view that exists and it seemed a shame not to develop it,” explained Marie Wallace.